“How Quilts Have Been Viewed and Collected” (Episode 6) explores the many ways quilts have been examined through lenses of history, society and art. More recently, the methods of interpreting and designing quilts have taken a decidedly scientific turn. Chemistry comes in to play with encaustic surface design and fabric dying. We discussed more of those scientific influences with quilt artist and teacher Sue Benner, who also happens to have a degree in molecular biology! What happens to the way we perceive quilts when they are taken off a bed and put on a wall? When a quilt is hung on a wall there is a chance, although slight, that the first thing spoken will not be, “My grandmother made quilts.” There is a chance that this quilt will be taken in as art—good, bad, or otherwise. I am not disparaging bed quilts or grandmothers. I love both, and hope to be a quilt-making grandmother someday! When we place a quilt on a wall with space around it, we are setting it apart to be examined for composition, depth, color, and possible meaning as other 2-D art forms. While I draw heavily from the traditions of painting and collage, I am still very much invested in the use of fabric, the stitching line, and the quilt form with all with its ties to the past (and even the bed). I describe my quilts as works “on, with, and about fabric.” There is always an underlying structure in my work, a set of rules. I think of each piece as a small world where I can declare the laws of nature. My education in molecular biology and medical illustration still figures in my work with an underlying sense of structure and organizing principles. I see a direct connection between the concept of quilt and the assembly of units to make a larger whole. What do you collect? What motivates you to collect? My love affair with fabric began with my first memories of the clothes my mother made me, recalling exact hue, fiber content, and weave. In the following years, my mother taught me to sew, carefully and creatively. I collect fabric, mostly in the form of used and vintage textiles – table linens, clothing, aprons, potholders, and Vera Neumann scarves. I entertain with them, wear them, give them away, cut them up and put them in my work. But, beyond using them, collecting textiles is its own reward. I am working on a new series in the studio and have felt a welcome renewal in my art. For 2014 I have been asked to curate a show for the MADI Museum in Dallas. In 2015 I’ll be having a solo show at the Texas Quilt Museum. In between I’ll be traveling all around the United States, Switzerland, Australia, and New Zealand teaching workshops and lecturing. 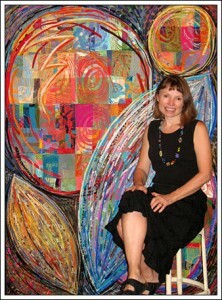 While pursuing a degree in molecular biology and masters in biomedical illustration, Sue Benner created her vision of the microscopic universe in painted and quilted textile constructions. Sue’s artwork is in many private, corporate, and institutional collections. 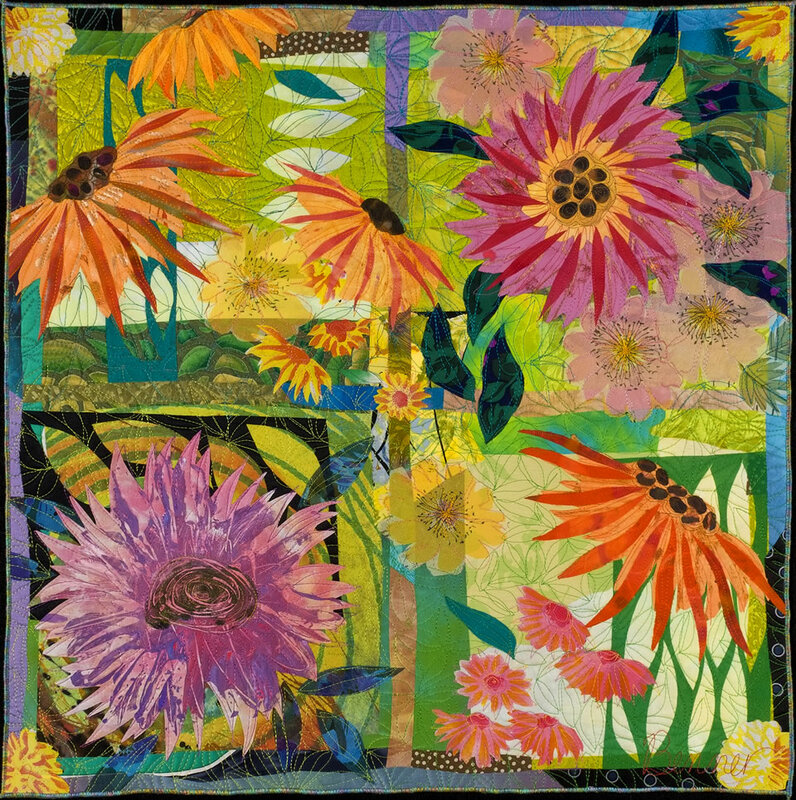 She also lectures and teaches workshops nationally and internationally in the fields of surface design, textile collage, fused quilt construction, and artistic inspiration. 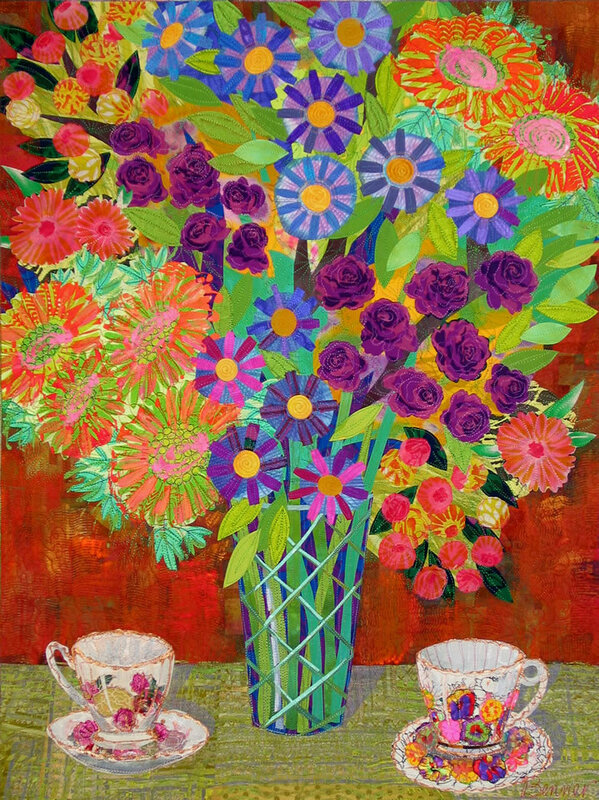 View a gallery of Sue’s work, along with her workshops and teaching schedule at her website Sue Benner Artist. Really enjoyed the discussion, Sue. You never cease to amaze! Looking forward to the Dallas exhibit and your one-woman exhibition at the National Quilt Museum. Proud of you. Well said!